The former Korean Air executive who was sacked and jailed for a 'nut rage' tantrum on board a plane has made a corporate comeback. Heather Cho, heiress to the South Korean conglomerate which owns the airline, has returned to work for another of its businesses. Ms Cho will take control of four hotels operated by the KAL Hotel Network. She hit the headlines in 2014, after forcing the plane to return to its gate during a row over how nuts were served. Ms Cho was fired and later charged after the incident on the runway of New York's JFK Airport. It emerged she had demanded a junior crew member be removed from the flight after they offered Ms Cho macadamia nuts in a bag, instead of presenting them on a plate. 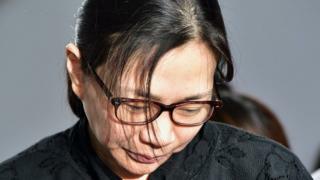 Ms Cho, 44, is the heiress of the Hanjin Group - one of South Korea's massive family-run business empires. At the time of the incident she was executive vice-president of Korean Air, and became another symbol of the excess and entitled culture in the country's so-called chaebols. Ms Cho was convicted of violating aviation safety, coercion and abuse of power in 2015. But after serving less than half of her year-long jail term, she was later cleared of violating the aviation security law and her sentence was suspended on appeal. The court maintained the minor convictions, including interfering with business practices, but reduced her penalty to 10 months in prison, suspended for two years. The Supreme Court upheld that ruling last December. The flight attendant she scolded, Park Chang-jin, has reportedly launched legal action against Korean Air, claiming he was demoted and has faced discrimination in the company since the incident.